The flip has switched from summer to fall, which — here at least — can mean a quick dive from hot to chilly. It’s easy to use this weather as an excuse to cease outdoor exercise, but don’t fall into the trap! 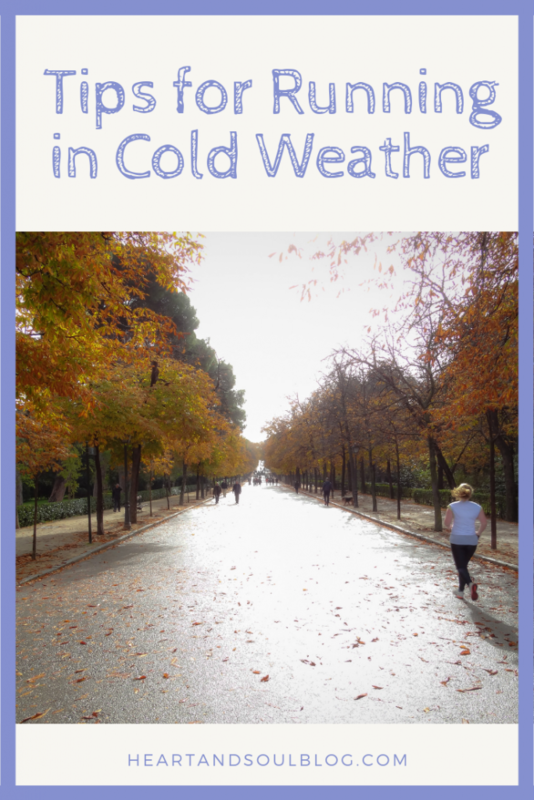 Today I have some really tips for running in cold weather that I hope you’ll find helpful! Here are the chief considerations when you are running in cold weather (which I’ll let you define; 40 degrees may be balmy to some and freezing to others! ): attire, preparation, nutrition, and gear. Let’s take it piece by piece. Layers are your friend! You want to start with a base layers — such as a long-sleeve tech shirt — and pile up from there. Vests can be great, or if it’s colder, a light or medium jacket. I always stick with tech material because it wicks sweat better, but you can use cotton or fleece if you prefer. I’m a big fan of running tights, too, instead of sweat pants. When it’s really chilly, I often layer two pairs. If you live in a truly cold climate, some brands make very thick fleece-lined tights. I also *highly* recommend something to keep your ears warm, especially in very cold temperatures. I wear a headband that doubles as ear muffs. Hats and gloves are also helpful. If you’re a newbie fall/winter runner, Runner’s World has this great chart showing how you might want to dress in certain specific temperatures. Oh, and don’t forget to wear shoes and socks. 😉 I even tuck my tights into my socks to keep my ankles warm. 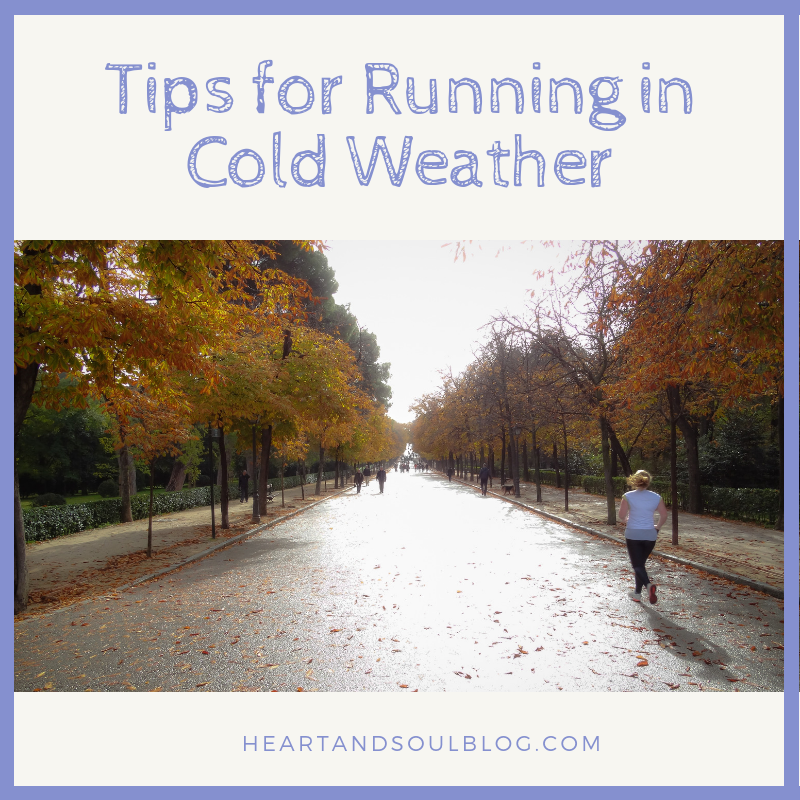 Running in cold weather requires different prep than running in heat. A huge piece of it is mental. It’s very easy to talk yourself out of the run you know you want to take because the temperature is less than great. Don’t give in to your excuses! Have your gear ready to go so it’s easier to get yourself out the door. Running in the cold can make your lungs hurt. One way to minimize this discomfort is taking long, deep breaths rather than quick, shallow breaths. If that doesn’t help, slow down your exertion. And another thing to prepare is warm, dry clothes to change into after your run. It’ll help take the chill off you and make you feel cozy afterward. Plus, I totally look forward to wrapping up in my fluffy robe after a cold run! Hydration is so so so important no matter the weather, but it can be hard to remember to sip when you’re running in cold weather. Don’t skimp on these fluids, though! If you’re doing a longer run and will need a hit of electrolytes, don’t bring anything that might freeze! There’s nothing worse than trying to bite into a frozen energy bar. Stick with gels, peanut butter crackers, or other things that won’t turn into a block of ice. Keep them close to your body, too. Competitor Running has some more great nutrition tips. If you’re a morning runner, chances are it’s happening in the dark now. Keep yourself safe by using a lighting device, such as a head lamp, or some kind of reflective gear. It’s always true that you shouldn’t run with both ear buds in, but that’s especially true in the dark. These are my favorite tips! Please contact me if you have others to share. Happy running all fall and winter!